We are one of the most prominent Copper Metal Sheets Manufacturers, based in India. The Copper Sheets, made available with us, are made up of high quality raw materials. They are available in various grades and technical specifications as per the requirements of the clients. The salient features of our Copper Sheets are high tensile strength, technical precision, durability, low maintenance, etc. As the result, they are used for making switches, radiators, terminals, connectors, locks, keys, taps, general stamping, icons and statues, deep drawing articles, and many more. Above all, we ensure the timely delivery of our Sheets. 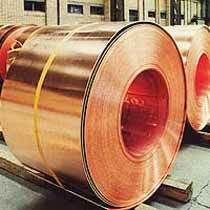 In addition to this, we are renowned as one of the most prominent Copper Metal Sheets Suppliers in India. Widely used in control panels the Copper Sheets manufactured by us are highly demanded owing to their excellent properties. Manufactured using high grade copper as per industrial standards, the Copper Sheets are available at market leading prices. Production of the Copper Sheets is strictly monitored from melting to finishing, giving the best quality and various beneficial features.